"Our family and the staff at Wolfe and Sons Funeral Home have made a commitment to the families of the communities in Leslie County and surrounding areas. It is our Mission to offer each family the most superior, dignified and affordable final tribute available for their loved ones. We are inspired to be 'the best thing on the worst day of your life'. Every family will be treated equally with personal compassion and the utmost respect. From the very smallest to the very largest detail, every wish will be carried out to its greatest potential. We are committed to serving our families the way we would want to be served during such a stressful life event." 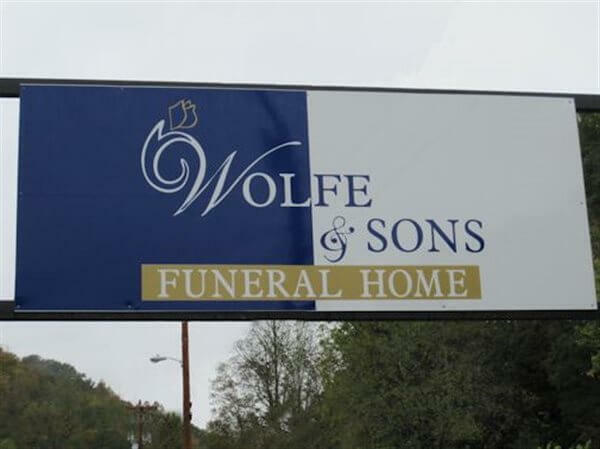 In October, 2006, Roger and sons, Jason and Kyle Wolfe established the Wolfe & Sons Funeral Home, LLC----an idea grown from a dream to a reality! Since the early 1970’s, Roger D. Wolfe had been a licensed Funeral Director working with many firms through the years. His son, Kyle Wolfe, had always dreamed of serving the “home-town” people in Leslie County and surrounding areas. Kyle graduated high school, went to college and became a licensed Funeral Director and Embalmer. Around the time the Wolfe family began planning for a future business, the old “Kemper Furniture Store” became available. They purchased the building and began a complete renovation---creating a very spacious and comfortable facility with a home-like atmosphere, large chapels and adequate parking. After the renovations were complete and licenses obtained for business, the doors were opened on October 9, 2006, providing the families of Leslie County and surrounding communities a choice in funeral service. Since the first day in business, Wolfe & Sons has served many more families with dignity and respect than ever anticipated in such a short time frame. They look forward to a long future of service and community involvement!